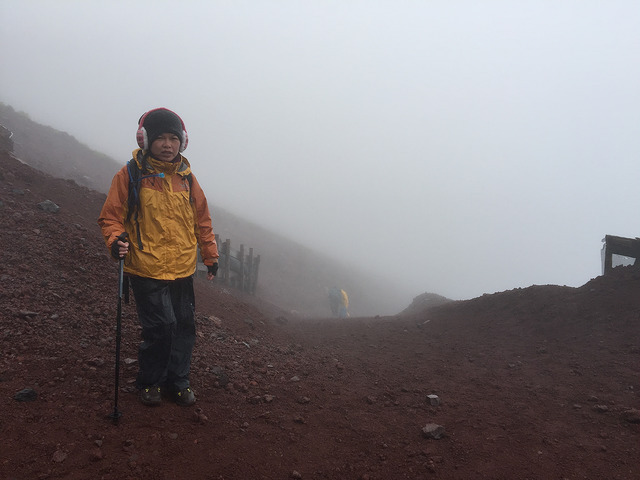 I Climbed Mt Fuji and Watched Sunrise over 3,000 Meters Above Sea Level! The title of this post is the highlight of the trek, and since I want to make an impression, let me show off this photo right here and now. I wish I could detail this moment but the truth is, the breathtaking view only lasted for about 10 minutes. As soon as the sun rose above the clouds, the sky turned into dark gray and all I could think of was how useful my raincoat was. A day before we headed to Fujikawaguchiko, my eldest sister warned me Typhoon Lionrock was about to hit Japan. Though it was forecasted to make a landfall somewhere northeast, the weather might be unpleasant during our trek. Since we had already booked everything (bus, train, accommodation, etc. ), Dan and I decided to follow our original plan. We had been planning and preparing for this trek for months, so we might as well give it a go, rain or shine. We arrived in Fujikawaguchiko, a town at the northern foothills of Mt Fuji, on a Saturday with the rain pouring down. Tsk, not a good sign. I asked the staff at the ryokan where we stayed if it was safe to climb Mt Fuji the following day. After checking the weather forecast, they said we could still carry on with our plans but we might experience more rainshowers than usual. It sounded risky, but we were up for it. The following day, we packed our things and off we took the bus to Fuji Subaru Line, 5th Station. It was cloudy, but at least it wasn't raining. We felt more hopeful the sky would clear up after a conversation with a couple of Filipinos who just came back from their trek. They said they couldn't make it to the peak (10th station) because they were already soaking wet at the 8th station, but we might be lucky since the sky looked better that Sunday. I doubted their statement for a moment when the first 500 meters was quite hazy. Fortunately, several meters further, the sun showed up, but it would sometimes hide behind a cloud or a drizzle. 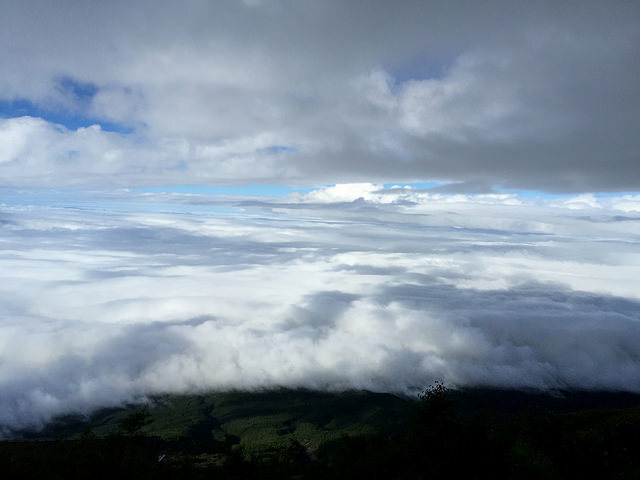 From the 5th to the 7th station, I had an "on and off relationship" with my raincoat, an inconvenience I'd rather tolerate just to observe astounding cloud formations. It's also much better than going up the rocky slope with the strong wind, rain, fog, and gravity joining forces to slow me down. The video below was taken close to the 8th station. What it was like from the 7th to the 8th station during our trek. Finally after 5 long hours, we arrived at Taishikan, our mountain hut at the 8th station, wet--and me with a headache. Yep, the altitude sickness was making a scene or perhaps it was the effect of the erratic weather on me. The staff greeted us by wiping our bags, raincoats, and shoes (talk about Japanese customer service!) and then showed us our sleeping area. I tried to eat dinner with Dan but my headache got the better of my appetite, so I skipped my curry and rice. As soon as we lay down on our mat, I slept in a snap, completely unaware of the snores and farts my husband would later complain about. Climbers usually leave the hut at 1:00 am, trek for another three hours to reach the peak, and watch sunrise there. Dan woke up around that time to pee but it was raining cats and dogs. 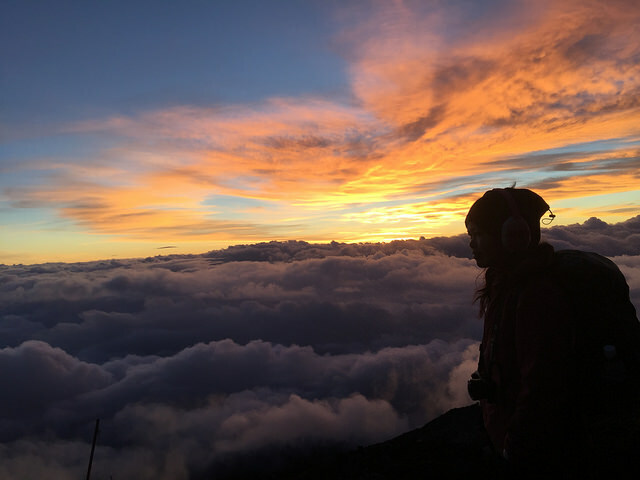 We figured out it might be better to trek in the morning, and just enjoy sunrise from our hut's viewing deck. At 5am, daytime greeted us with a wonder of nature. Sea of puffy clouds and yellow-orange streaks of sunlight--what more could we ask for? None...was a wrong answer. Ten minutes after the sun rose, the wind blew hard and brought more heavy clouds and showers to Mt Fuji. We went up for about an hour and a half, but the trail just got darker and darker despite the time of the day. At around 3,400 masl, the three grandfathers (?) ahead of us talked to a group of climbers going down and then decided to turn around. With my struggling Japanese, I asked for the reason and they said the wind was too strong towards the peak. The group they talked to wasn't able to make it, either. Sensing my frustration, one of them told me, "It's all right. Just come back next time; the mountain won't run away." It was raining the entire time we went down the slippery trail. The sky empathized with me. Nevertheless, it was a great experience climbing Mt Fuji despite the harsh weather, but I hope next time, the sky will be on our side.